I’ve said it before and I’ll say it again – I’m a terrible housekeeper. 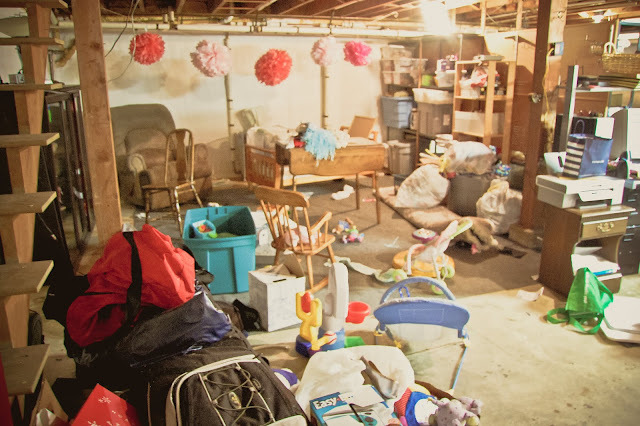 Our basement has been a dumping ground for things that we didn’t feel like dealing with and old boxes that just keep making the moves with us. So we’re(me mostly) sorting – choosing what’s worth keeping (photos of our grandparents that we needed to get out of the basement asap) and what’s trash (anyone need an old girl scout sash complete with badges??). It’s so funny to be looking forward to a weekend of cleaning, but I am. A weekend at home with all of us here, beautiful weather, a Saturday night date with John – it all sounds fantastic. Especially after today – I literally went and googled to see if it was a full moon. We were all completely off yesterday – Nick slept almost all day and I would have sworn that he was sick. Mia didn’t nap at all yesterday. They both woke up grumpy AGAIN today. I lost my patience with a big, mean, “WHAAAAAAAAAAAAAT?? ?” after the 1,000th “MOM MOM MOM MOM MOM” of the day and wound up apologizing in tears for being so cross and for the fact that she was saying it so many times because I wasn’t listening to her in the first place. So, we had a little lesson about politeness and getting someone’s attention with an, “Excuse me, ____” and waiting for their response. And, for today, it actually worked. So we’re starting over. Naps all around this afternoon. Work for me tonight and a date with daddy tongiht for the kids. All of us home for the next two days. Walks around the neighborhood, breakfast in the mornings, painting, basement organizing, yardwork and a whole lot of playing outside are on our agenda.